In January of this year, the final movement of commercial fuel on rail was undertaken without any major fanfare or send off. For decades, fuel has been transported by rail to various locations around the state, to places as diverse and far away as Wagga Wagga, Goulburn, Cooma, Tamworth, Dubbo, Canberra and so on. Indeed, it was often commonplace for a goods train to include in it’s load a number of tank wagons loaded with petrol, diesel fuel, or even more exotic cargo, such as ammonia or bitumen. 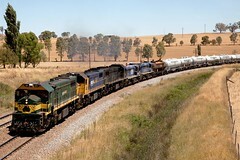 While the latter freight has since moved to specialised haulage, bulk fuel trains could be seen on the rails of NSW as late as January, 2010. While it would be a mammoth task to document the entire history of the transport of bulk fuel by rail in NSW, this article will instead focus on the final days of the bulk fuel train. 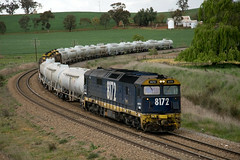 The end of the fuel trains in NSW came from a decision by Shell Australia to close the rail loading point at Sandown. Located near the end of the short Sandown branch in Sydney’s western suburbs, the rail gantry had been the only place where liquid fuel could be loaded onto railway wagons for some years. Shell Australia informed Pacific National of this decision during 2009, which would result in the loss of four fuel services from the company books, namely a twice weekly service to Canberra, a twice weekly service to Dubbo, a weekly service to West Tamworth and a Caltex/Ampol service to Bomen (located near Wagga Wagga in the Riverina area of Southern NSW). The latter service, despite not being operated by Shell Australia required the rail gantry to load, with fuel being piped from the Caltex Refinery at Kurnell (Botany Bay). The closure of the rail gantry is largely due to changes in NSW legislation covering dangerous and flammable goods, as well as the cost of maintaining the gantry – these costs combined with the double handling costs of transporting fuel by rail and then road have made the services unviable for Shell Australia. The closure of the gantry would also lead to the use of road haulage to transport fuel to the various fuel points around the state. Previously, fuel for depots such as Cootamundra or Parkes would be placed on any compatible service bound for such a destination. In the case of the former, 1327 Bomen Fuel was the most common train used, while in the case of the latter, the fuel wagons would often be attached to a westbound NY3 SteelLink service at Enfield or Chullora. The services to Tamworth and Dubbo succumbed first, with the final Tamworth train departing Sandown on Friday, November 13th 2009 behind X48 and X51 (with 8137 being attached at Newcastle, reportedly due to problems with one or both of the X Class). 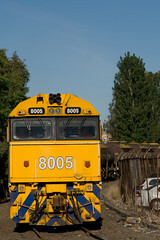 The final Dubbo service departed less than a week later behind 8140 and 8050 on Tuesday, November 17th 2009. The final Caltex train to Bomen would depart Sandown on Friday, December 17th 2009, hauled by X52, X50 and X51. Interestingly, for the run back to Sydney the three locomotives would be joined by 48114 (d/a) and 4899 (d/a), with the latter unit being one of the GrainCorp allocated 48 class. The last train to succumb to the pending closure of the gantry would be the Canberra fuel service, with the final train hauled by X48 and X50, departing Sandown on the 20th of January, 2010. When the train returned to Sydney the following evening, it would be the end of an era. Although in their final year, the fuel trains were tasked primarily to the X, 80 and 81 class locomotives, it is interesting to look back a decade to see how different things were. During 1999, locomotives from the 422, 48 and 80 classes were the dominant motive power on the Canberra service, although 8242 assisted 42203 with the northbound oil on Thursday, May 20th 1999 – certainly not a combination seen during 2009! Then again, the combination of EL61, X48 and 8004 on 1825 Dubbo Fuel would have been unheard of back in 1999! One would be considered mad for even suggesting it. As for the future of the locomotives and rolling stock, that is still left to speculation. A cursory glance around the state reveals that the final fuel trains to operate to their respective locations left a number of NTAF wagons at the depots for unloading, and these remain at the depots to this day. The locomotives will continue to see use with Pacific National, with the X Class having been sighted on domestic grain trains, Manildra Group flour services, and even the Tarago garbage train! It will be interesting to see if the X and 80 class will now play second fiddle to 81 class locomotives, or if they will still be allowed to lead trains – certainly the crews of the fuel trains didn’t have much choice in the matter! With the recent public outcry over the transportation of dangerous goods by road (especially in B-double tanker trucks), the move from rail to road, despite being economical in terms of dollar per km transported, has attracted a large amount of criticism from members of the public. Although the gantry will still close, and the wagons will be stored somewhere, it would be rather naïve to expect that this is the end forever – a return to rail is not impossible, there just needs to be a will, and a way. Time will tell. Excellent article and nice shots, including your flickr set. This adds to the article recently published in the Railway Digest.